John Arnold Cranston was a graduate of the University who collaborated with Frederick Soddy and Alexander Fleck in establishing the concept of isotopes. He is credited as one of the discoverers of the element Protoactinium (later named Protactinium). 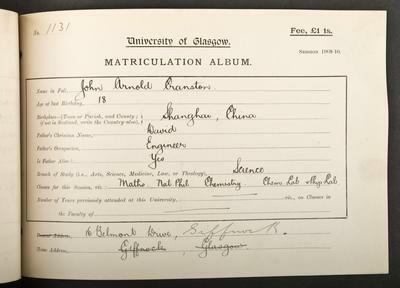 Born in Shanghai, the son of a water engineer, Cranston studied at the University and graduated BSc in 1912. He worked with Soddy as a researcher in the Department of Chemistry until Soddy went to the University of Aberdeen in 1914. In 1915 he went to fight in France with the Royal Scots Fusiliers and later as a gas officer with the 30th Division. In 1918, Soddy announced the results of the investigations into 231-Pa Protoactinium, at the same time as a group of scientists who had been working independently in Germany. It is said that Cranston had completed his investigations by 1915, but had left his equipment and the first samples of the element locked in a cupboard at his house when he went off to war in 1915. His DSc thesis entitled An investigation of some connecting links in the disintegration series of uranium and thoriumin was published in 1920. He continued to publish throughout his career but his most influential work remained The Structure of Matter, published in 1924. 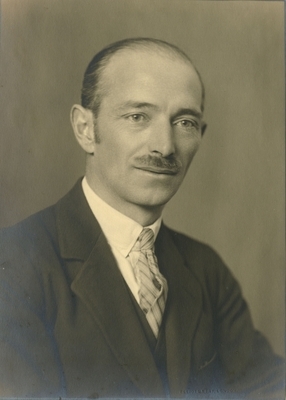 Cranston was appointed a lecturer at the Royal College of Science and Technology (now the University of Strathclyde) in 1919, where he worked until his retirement in 1957. He was given an honorary LLD in 1963. He died in 1972.